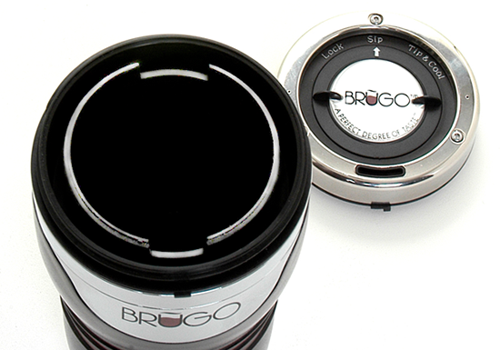 When I first heard about the Brugo Self-Cooling Coffee Mug I couldn't have been more excited. Most of my current travel mugs are a mixture of success and failure. I often burn my mouth or tongue from a very hot cup of coco in the morning when I'm not patient. I'm also famous for spilling it when I forget to close the top properly. The Brugo Self-Cooling Coffee Mug has none of these issues. "Lock", which closes the cup. It works. When I tried a straight SIP the coco was pumping hot, but as my mom and I drove while on Tip and Cool, the coffee was slightly cooler and not scalding. The mug has a dial on the top that allows you to dial the lock, sip, or tip and cool. It's very easy to use and while driving not having to constantly shut the travel mug top was also a plus. This travel mug is awesome... so awesome that my mom stole it! 1. Visit and choose your favourite colour from the Brugo Mug website. Make sure you leave me a comment telling me what colour you'd love to have! "Win a Brugo Self-Cooling Coffee Mug from @kimmie_1980 http://tinyurl.com/242o486 #giveaway"
***Giveaway ends August 8, 2010 @ 11:59 ET!!!! *** Make sure you leave the right amount of comments so you get the proper amount of enteries. * This giveaway is available to all readers (international). I WILL RESPOND TO COMMENT'S ONCE A WINNER IS SELECTED... I HAVEN'T FORGOT ABOUT YOU ALL! I like the passion one and I am a follower! Following you on twitter @suburbsanity. Liked Brugo on Facebook as Suburb SAnity. Following Brugo on twitter @suburbsanity. My favorite brugo mug color is Flamingo! I liked brugomug on facebook as Melissa Belle. I'm a follower, and my favorite is "Passion"
I love the mist color. I would get the Navy Blue cup! I like BrugoMug on facebook!! I'm following BrugoMug on Twitter!